August | 2013 | Franchising You. Imagine others promoting your business for you! This premise is why networking is a crucial part of growing any business, and the benefits are numerous. It’s an effective way to expand your knowledge, to learn from the success of others, to attain new clients, and to spread the word to others about your organization. 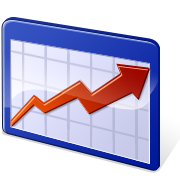 Your return on investment includes an increase in brand equity, goodwill, and revenue. In a world where the phrase “it’s not what you know but who you know” is king, networking provides the opportunity to foster connections with influential people. Once you nurture these contacts, people will begin to share their ideas, knowledge, and best practices with you. The ability to absorb valuable feedback and viewpoints, and unique points of view is essential when growing a business. As you attend events regularly, people will recognize you more and more. This will help you build your reputation as a community-minded individual and local thought leader in your area of expertise. You’re not only building connections with the people physically in the room but also within their spheres of influence. If you make an impression you will likely get a referral. Referrals are some of the most valuable leads for a business. People trust their friends’ recommendations and will base most, if not all, of their purchasing decisions around this influence. Here are simple tips to becoming a networking expert. Arrive early: When you arrive early to an event, it is overall more enjoyable. People haven’t formed their groups yet, so it is easier to settle in and mingle. Be recognizable: When appropriate, wear clothing with your company’s logo or a quality name badge with your name and logo. If attendees are able to quickly gather what organization you are representing, they may approach you for conversation. Bring a friend: Bringing a co-worker or peer to a networking event can be a calming idea. However, if you go this route, split up after arriving. It will do you no good to sit and talk to one another for the duration of the event. Be authentic: It is okay to admit it is your first time at the event. This might have a disarming affect and may spark additional conversation or introductions. 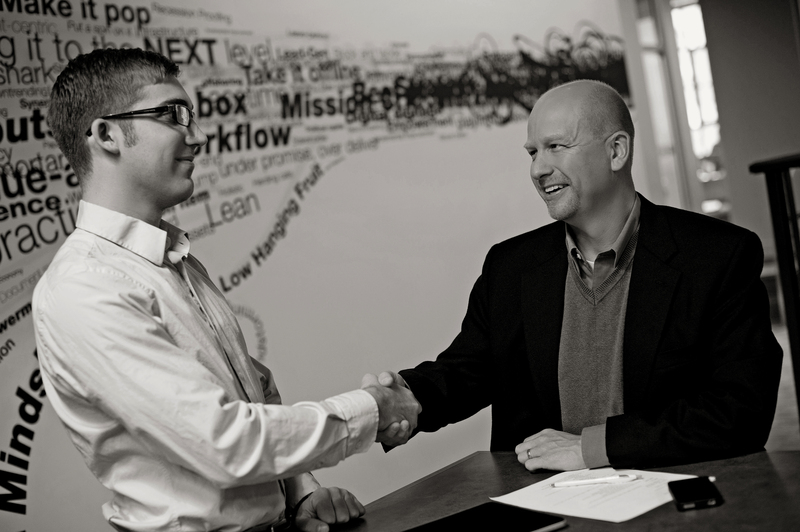 Build relationships: Networking is about building a relationship before you need it. Don’t expect people to automatically give you referrals. It is a good practice to provide something for them first and in return they will help you at a later point in time. Attend consistently: If your goal is to establish long-term relationships, you must attend networking events consistently. If you can’t make one event, send another company representative to maintain the momentum. Follow up: Now that you have made these worthwhile connections, it is important to follow up with them. Consider sending an email to your fresh crop of acquaintances and relaying how nice it was to connect, or jump on LinkedIn and invite them to connect. 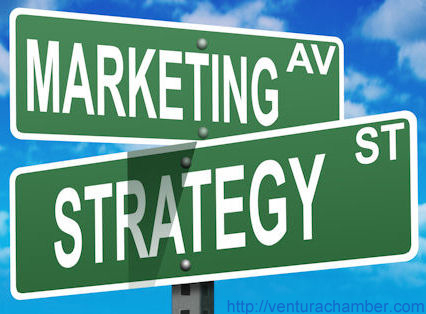 Want to market your franchise location but not sure where to start? While it seems most people would consider themselves marketers, some marketing techniques may not be so straightforward. Depending on if you own a franchise with strict marketing rules, there are some easy and effective marketing tactics you can implement now which will usher in the leads! Direct mail marketing. You arrive home from work and stroll to the mailbox to retrieve the mail. While sifting through your monthly bills, your eyes wander toward the coupons and postcards. Everybody loves a good coupon. Pair that with a visually appealing, one-message ad and you have a win-win situation. That direct mail postcard may linger on the kitchen table or counter while the consumer waits for the perfect opportunity to use it. Just be sure you’re message is aimed toward the appropriate demographics so that postcard lands in the proper consumer’s hand. Social media. The social media world has evolved tremendously in just a few years since Facebook and Twitter’s inception. Nowadays, if you don’t have at least a Facebook page, you’re falling short of awesome. Start with creating an attractive Facebook page, complete with a unique, well-branded cover photo and profile photo showcasing your business. Fill in the About section completely with a blurb describing your business, your website URL and your address. Most importantly, post engaging content on a consistent basis! If you’re feeling really adventurous, throw in a Facebook contest to gain likes, or invest in a little Facebook advertising to garner additional traffic to your page. Public relations. While most people shy away from local public relations for their business, it’s pretty simple and it’s free. If you aren’t well-versed in how to write a press release, do a little research online to learn how to construct a simple release. Press releases can be drafted to highlight various events or activities in which your franchise is involved including charity events, hiring news, franchise growth trends, or events your franchise will be hosting. Once you have your release drafted, research all the local media outlets including newspapers, magazines, broadcast news, and radio stations. Research each media outlet’s website to create a list of media contacts and newsroom emails. Send your press release to all the media contacts you’ve found. Follow up with your sources if necessary to see if they’re interested in running the story, then continue creating and establishing relationships with your contacts for future releases. Online marketing. It may be a no-brainer, but having a website that showcases what your business offers is essential to secure your fair share of online leads. These days, people turn to the Internet to research a company and to find contact information or addresses. Like most consumer-faced advertising, it’s critical your website features photos which encompass what your business is all about, along with engaging and well-written content. Make it as easy as possible for potential customers to find a physical address for your location and a phone number in case they need to reach you. Add to that social icons if you have a Facebook or Twitter, or if you blog, so prospects can easily ascertain the additional engagement between your business and other customers. Grassroots marketing. This one is fun and easy to do. The first step is to create swag. By swag I mean creative and well-designed brochures or business cards for your business, cool branded merchandise which people will actually wear or use (mugs, t shirts, bottle openers, pot holders, etc. ), and other giveaways you can distribute. Depending on what your business concept are and to what audience you cater, think of places you might visit where you can leave behind these items for people to pick up, such as apartment complexes or the mall. If your business is sponsoring an event, pass out these items as well. Brainstorm other ways to get your name out there, such as renting a booth at local women’s expos, realtor trade expos, or bridal shows. Join a local chamber and attend lunches or chamber-hosted events. Shake hands, pass out your business cards, and get traction in making a name for yourself in your community. Having a franchisor who is invested in your success is vital. Knowing you can reach out to the marketing team for questions or assistance with any marketing tasks you’re considering is a key benefit to joining a proven system. TWO MEN AND A TRUCK®/International, Inc., has a solid marketing support system which assists franchises in a variety of areas to create brand awareness for the growing business. Aiming to sell 25 projected units by end of year. It’s a perfect time to be a franchisee. We are very excited to announce TWO MEN AND A TRUCK® has seen stellar growth for the past 44 consecutive months. We are on track for another year of strong system-wide sales, and we aim to build off of our 25 straight months of double-digit growth. To date, our company has achieved revenues of $144 million and year-over-year growth of 20 percent through July with five months left in the calendar year. Compared to $260 million in revenue in 2012, we are on track to reach and possibly exceed last year’s performance, considering our busiest moving months historically occur during the summer. There are vast franchising opportunities with TWO MEN AND A TRUCK® as we continue to grow and as our franchising development team aims to sell a projected 25 units by the end of the year. They have 20 units currently in development and maintain key expansion target markets of Washington D.C., Virginia, Maryland, Texas, Southern California and Portland, Ore., we are also eyeing overseas expansion in the future. As planning carries out, our ambitious 2013 growth plan closes in on triple the amount of new locations we had at the close of 2012. Additionally, we plan to operate a total of 400 locations within the next five years while doubling our corporate office team, expanding the headquarters by 25,000 square feet, investing in automation, and increasing the company referral rate as close to 100 percent as possible. We currently hold a 96 percent positive referral rate and operate in 36 states. Our brand has capitalized on the increased interest of prospective franchisees in the service segment of the industry. We have many franchisees starting with a single territory and expanding once properly funded, the scalability coupled with the start-up costs between $173,000 and $578,500 (depending on the purchase or lease of a truck fleet) has positioned us as a company to meet our aggressive goals. By 2018, the brand plans to exceed $750 million in revenue. In order to meet the revenue goal, TWO MEN AND A TRUCK® spent the past four years carefully preparing and re-focusing the brand for continued expansion. With 243 U.S. locations and 266 globally, Sorber said re-investing in technology, focusing on hiring talented people, and refining already solid operational systems throughout the franchise network have all been vital components in our ability to grow. To inquire about franchising, visit our website. Celebrating more than 50 years of excellence, education, and advocacy, the International Franchise Association is the world’s oldest and largest organization representing franchising worldwide. The IFA’s mission is to protect, enhance, and promote franchising through government relations, public relations, and educational programs. 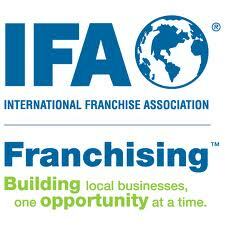 The IFA has thousands of members worldwide (franchisees, franchisors and suppliers) and continues to grow. Think of the IFA as a three-legged stool made up of franchisees, franchisors, and suppliers. The IFA strives to bring educational value and protection in the form of advocacy to all three parties. TWO MEN AND A TRUCK® has been a member of the IFA since 1993! We have attended the IFA Annual Convention for nearly 20 years. When we became members, it was before the Internet was used like it is today. That said, we were extremely eager to learn more about the franchise business model and what it would take to become the best franchise system possible. Education through the IFA was our major area of focus in those early years. Today, TWO MEN AND A TRUCK® continues to be a very active member participating in most areas of the IFA. We find continuous value in the networking, best practices learned, franchising resources, and franchise advocacy. Many of our TWO MEN AND A TRUCK® franchisees attend the Franchise Public Relations Conference in Washington DC. This year it is being held Monday, September 16 and Tuesday, September 17. This is where our industry comes together to learn about potential bills that could directly impact our business including affordable health care, immigration reform, and card check, just to name a few. At the conference we listen to speakers, we learn the impact of the issues, and then we hit Capitol Hill with our team captain to speak directly with elected officials. These meetings have a tremendous impact and since you vote for these elected officials, it’s no surprise you have their full attention. It is also a perfect opportunity to meet fellow franchisees, franchisors, and suppliers that live and do business in your same area. It’s good for your brand! For more information on the IFA Public Affairs conference, please go to the IFA web site. Hope to see you in DC ….power in numbers! It is absolutely crucial to support the IFA lobbying efforts that protect our industry; franchisees, suppliers, and franchisors. How can you help? By giving a personal donation to FranPAC. Currently and thankfully the IFA has a million dollar PAC, while this gets much needed attention on Capitol Hill, we need to maintain this million dollar level. Every dollar you give helps the IFA fight harmful legislation. There are many giving levels starting with the 365 Club (a dollar a day) up to a $5,000 limit (Chairman’s level). For more information on FranPAC, please go to the IFA website. The IFA has so much to offer, I’m thankful for this Association that’s had such a major impact on our company, TWO MEN AND A TRUCK®, and the franchising industry as a whole. The IFA understands customer service!! It’s no secret that in recent months TWO MEN AND A TRUCK®’s Franchise Development team has been heavily focused on both expansion opportunities and brand awareness in Washington DC and its surrounding markets. Oftentimes, the best way to raise awareness begins with reaching out to an audience who is already familiar with your brand, then partnering with them to spread the word. Great relationships can be built and fostered in this manner, and every now and then, if luck strikes, great community-based opportunities arise. On Thursday, TWO MEN AND A TRUCK® sponsored an open house at Lansing’s Center for New Enterprise Opportunity (NEO), the capital city’s only business incubator, which offers low-cost rent, programming, and educational and mentoring resources. The opportunity came about while our Franchise Development team was hosting a watch party for the DC Spartans, a chapter of the MSU alumni association, during the men’s basketball sweet sixteen tournament run. At this event, Business Developer Tom Parks and Franchise Development Director Kelly Rogers were pleasantly surprised to run into some familiar faces; Betsy and Robin Miner-Swartz, also from Lansing, were in the area in support of Michigan State University’s Women’s basketball tournament appearance. Over dinner, conversation inevitably turned to Lansing-based news and events. As Betsy and Robin described their involvement as board members of NEO, Tom and Kelly became very excited about the prospect of working with young entrepreneurs who may not have considered franchising as an option of business ownership. Months passed without much follow-up action; however, Tom and Kelly would continue to run into Betsy and Robin at various networking events around the Lansing area and reminisce over their random encounter in DC. When Betsy approached TWO MEN AND A TRUCK® about sponsoring an open house to raise awareness of NEO, the Franchise Development team jumped. Kelly believes this event was a valuable way to give back to the community, to remember where Mary Ellen, Brig, Jon, and Melanie started, and to foster new entrepreneurial talent. 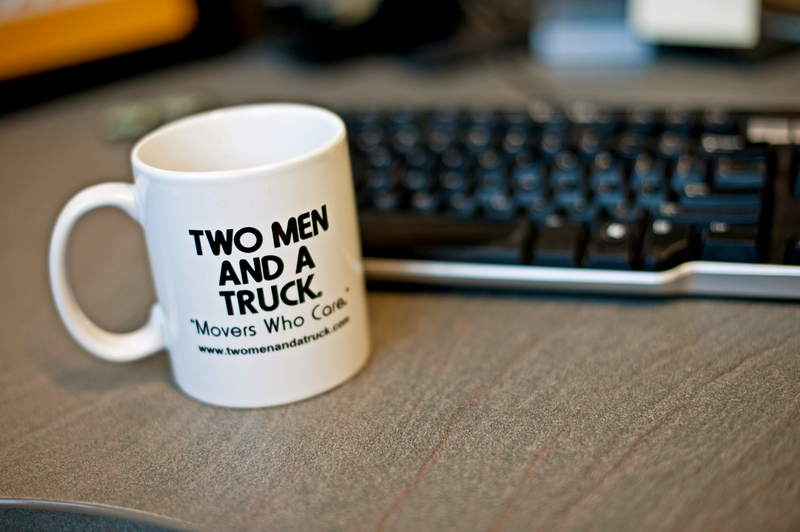 TWO MEN AND A TRUCK® is focused on moving people forward as part of the new vision under which the company is operating. This applies to customers, the team at the Lansing headquarters, the more than 260 franchise locations, and the communities in which we operate. By working with NEO, TWO MEN AND A TRUCK® is delivering on this vision within our home community. It’s hard to convey how much this truly means to our company and the family. The public open house-style event at the NEO Center at 934 Clark Street in Lansing proved to be an entertaining mixer, with opportunities to chat with entrepreneurs and to enjoy food, drink, live music, and art designed to recognize great entrepreneurial stories of the Lansing area. During the event NEO revealed a sculpture designed by Red Head Design made from TWO MEN AND A TRUCK® boxes and other materials. 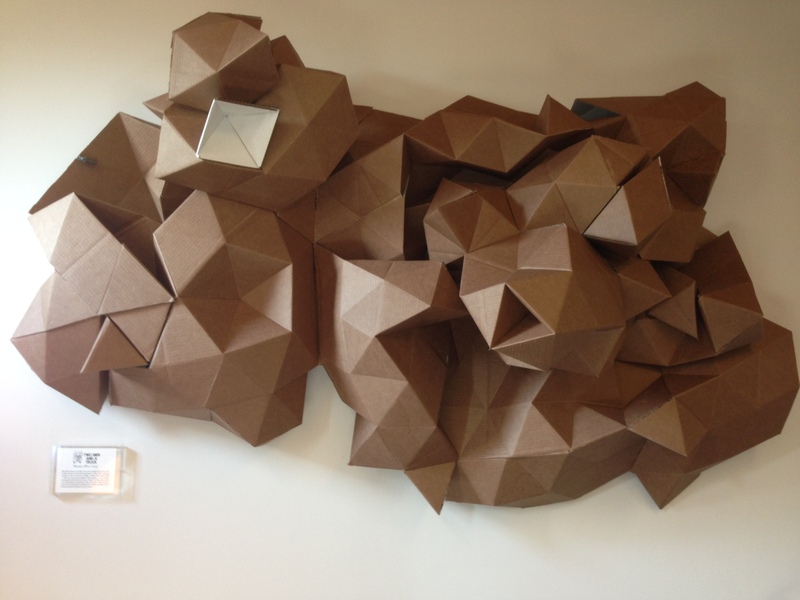 The art adorns the ceiling and walls of the NEO Center as a reminder to tenants of the business incubator that they could very well be the next big idea, the next international company which helps move people forward.